[PDF] Peter Reinhart's Whole Grain Breads: New Techniques, Extraordinary Flavor | Free eBooks Download - EBOOKEE! Description: We know whole grain breads are better for us, but will we actually eat them, much less take time to bake them? Yes, says beloved baking instructor Peter Reinhart, but only if they are very, very good. So Reinhart, with his decades of experience crafting amazing artisanal breads, has made it his mission to create whole grain breads that are nothing short of incredible. 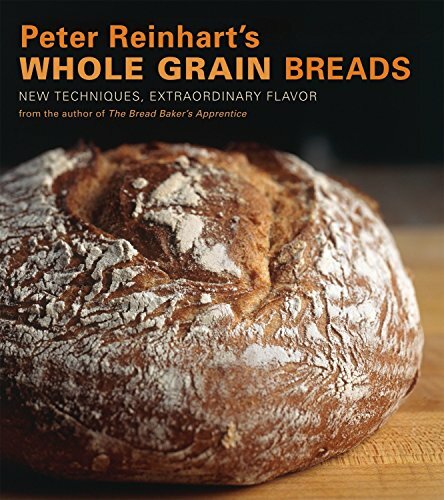 In this follow-up to his award-winning book The Bread Bakerâ€™s Apprentice, Reinhart offers groundbreaking methods for making whole grain breads that taste better than any youâ€™ve ever had. And because his approach is also simpler and less labor intensive than conventional techniques, youâ€™ll choose to make and eat these breads. His fifty-five recipes for whole grain sandwich, hearth, and specialty breads, plus bagels, crackers, and more, incorporate widely available whole wheat flour as well as other flours and grains such as rye, barley, steel-cut oats, cornmeal, and quinoa. Each is so rich with flavor and satisfying texture that white-flour counterparts pale in comparison. Written in Reinhartâ€™s famously clear style and accompanied by inspiring photographs, these recipes were perfected with the help of nearly 350 testers. Introductory chapters provide a tutorial, with step-by-step photographs, of the delayed fermentation method that is at the heart of these recipes, as well as a crash course in baking science, discussions of grains other than wheat, and more. Advanced bakers will relish Reinhartâ€™s innovative techniques and exacting scientific explanations, and beginning bakers will rejoice in the ease of baking wholesome breads with such extraordinary flavor. 2017-11-26[PDF] The 50 Best Whole-Grain Recipes: Tasty, fresh, and easy to make! No comments for "[PDF] Peter Reinhart's Whole Grain Breads: New Techniques, Extraordinary Flavor".